Google's HQ, otherwise known as Googleplex, is situated in Mountain view, California in Silicon Valley. Throughout the corridors between the four buildings, there are all sorts of Google memorabilia on display. They even employ guides who specialize in explaining Google's history to people. 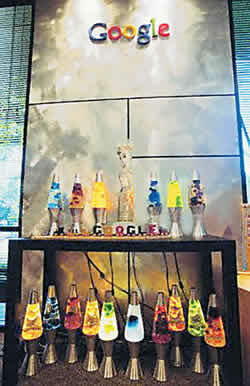 There are lava lamps everywhere, as well as free coke and candy all over the place. They've also got huge multicolored exercise balls everywhere. 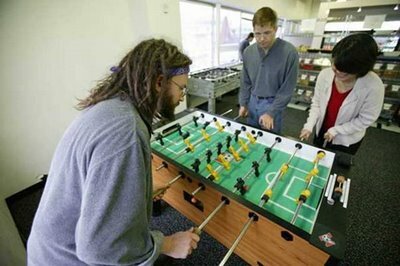 People's workspaces are full of individuality, and the atmosphere is relaxed. There are couches everywhere. People can have a lie down when they need to and take a break. Google's staff loves sports. 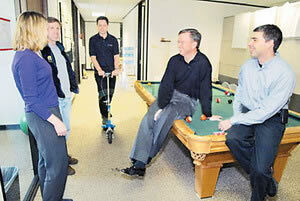 The big guns often have meetings at the pool table or in the corridors. The casual atmosphere in Google HQ can be demonstrated by the fact that staff can bring their pets to work, and the pets are allowed to wander around the office. Heaps of people have pets at Google HQ. 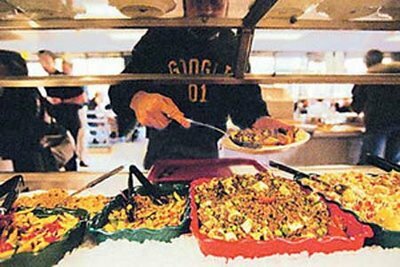 There's a rule within Google: that there must be food within 100 feet of every employee. 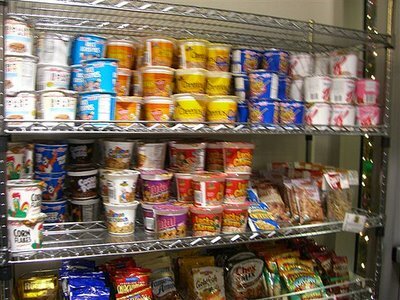 There was once an engineer who felt a bit ripped off about that rule because his nearest food counter was 120 feet away, so he asked for the error to be corrected, tongue in cheek. The relevant department replied: "There's a restaurant right above your desk, and you are definitely less than 100 feet from that one." 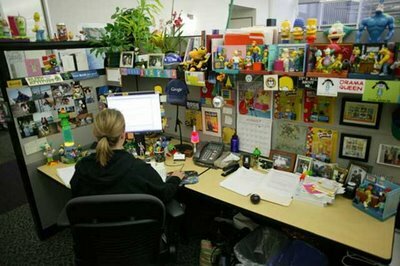 This looks more like a toyshop than a workspace! 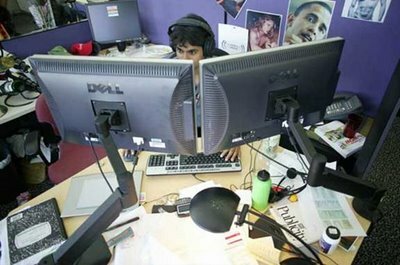 Rumor has it, a dude who had just joined Google had not been able to find a flat, so he lived at Google HQ for a month. He lived a lot better than Tom Hanks in The Terminal. Meals are provided, couches everywhere, there are showers in the bathrooms, a gym and a swimming machine. There are even pianos in music rooms you could use. Better than the facilities at home! The dude didn't leave Google HQ for a month straight. 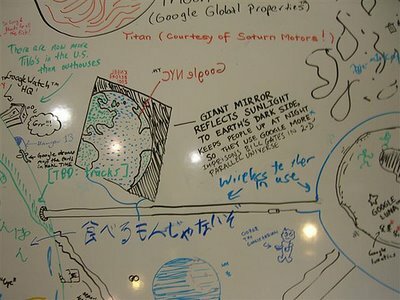 Whiteboards at Google HQ are filled with all sorts of great (or not) ideas in all sorts of different languages. 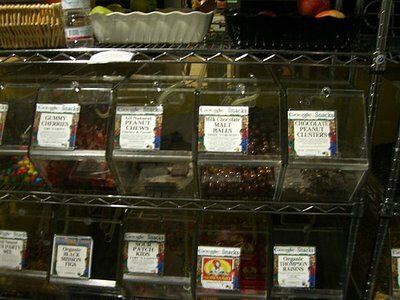 There's free food all over the place, it almost look like a supermarket. 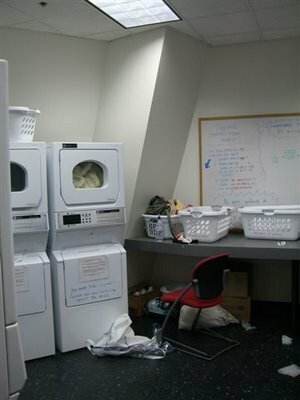 There's also a free laundry room for use for the staff. 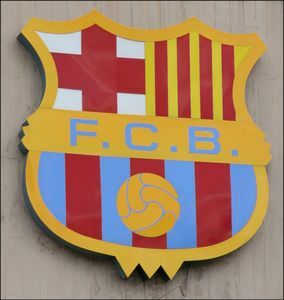 It seems that Chelsea and Barcelona are forever linked in headlines. When the teams aren't playing each other or arguing, there are articles about them buying players from each other and the latest is a revival of the Frank Lampard rumour. Lampard has a Catalan partner which means a fair number of people are always putting 2 and 2 together to make a move to Barca. When Michael Ballack arrived at Stamford Bridge the speculation intensified, as the German does tend to be the boss of any side he plays for. The latest twist is that Deco is being offered as part of a swap deal, despite the fact that the Portuguese star turned down the chance to join Chelsea in 2004. Deco himself had denied any knowledge of it but given the way that the Big Two in Spain work in the transfer market, that proves very little. Would Lampard himself like another challenge? There are very few players who aren't tempted by the chance to play at the Nou Camp and he's certainly won a bagful of medals at the Bridge. If Chelsea were to add the Champions League this season, then the midfielder might feel the need for a new experience. After a mediocre World Cup Lampard is showing signs of being the dominant attacking midfielder again. He certainly looks the type of player to win over the Barca fans so this is a story that can't be ruled out for now. One advisor, an Electrical Engineer, answered first. "It is a toaster," he said. The advisor: "Using a four-bit microcontroller, I would write a simple program that reads the darkness knob and quantifies its position to one of 16 shades of darkness, from snow white to coal black. The program would use that darkness level as the index to a 16-element table of initial timer values. Then it would turn on the heating elements and start the timer with the initial value selected from the table. At the end of the time delay, it would turn off the heat and pop up the toast. Come back next week, and I'll show you a working prototype." The second advisor, a software developer, immediately recognized the danger of such short-sighted thinking. He said, "Toasters don't just turn bread into toast, they are also used to warm frozen waffles. What you see before you is really a breakfast food cooker. As the subjects of your kingdom become more sophisticated, they will demand more capabilities. They will need a breakfast food cooker that can also cook sausage, fry bacon, and make scrambled eggs. A toaster that only makes toast will soon be obsolete. If we don't look to the future, we will have to completely redesign the toaster in just a few years." "With this in mind, we can formulate a more intelligent solution to the problem. First, create a class of breakfast foods. Specialize this class into subclasses: grains, pork, and poultry. The specialization process should be repeated with grains divided into toast, muffins, pancakes, and waffles; pork divided into sausage, links, and bacon; and poultry divided into scrambled eggs, hard-boiled eggs, poached eggs, fried eggs, and various omelette classes." "The ham and cheese omelette class is worth special attention because it must inherit characteristics from the pork, dairy, and poultry classes. Thus, we see that the problem cannot be properly solved without multiple inheritance. At run time, the program must create the proper object and send a message to the object that says, 'Cook yourself.' The semantics of this message depend, of course, on the kind of object, so they have a different meaning to a piece of toast than to scrambled eggs." "Reviewing the process so far, we see that the analysis phase has revealed that the primary requirement is to cook any kind of breakfast food. In the design phase, we have discovered some derived requirements. Specifically, we need an object-oriented language with multiple inheritance. Of course, users don't want the eggs to get cold while the bacon is frying, so concurrent processing is required, too." "We must not forget the user interface. The lever that lowers the food lacks versatility, and the darkness knob is confusing. Users won't buy the product unless it has a user-friendly, graphical interface. When the breakfast cooker is plugged in, users should see a cowboy boot on the screen. Users click on it,and the message 'Booting UNIX v.8.3' appears on the screen. (UNIX 8.3 should be out by the time the product gets to the market.) Users can pull down a menu and click on the foods they want to cook." "Having made the wise decision of specifying the software first in the design phase, all that remains is to pick an adequate hardware platform for the implementation phase. An Intel Pentium with 48MB of memory, a 1.2GB hard disk, and a SVGA monitor should be sufficient. If you select a multitasking, object oriented language that supports multiple inheritance and has a built-in GUI, writing the program will be a snap." We all know that Ronaldinho is number one on football field… but very few people might have seen his house in Spain… see the following superb pictures to know how well he decorated his house…. I had some technical problems with my host and blogger. all of my posts vanished.